The tablet convertible, the two-in-one – call it what you will. 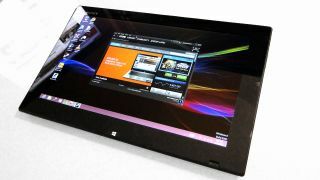 But I think the Windows-based tablet that converts into a laptop is a concept that doesn't get nearly enough cred. OK, so there are Ultrabooks, but what we want is a true convergence device that's greater than the sum of its parts and when somebody finally get it right, they'll be beating off punters with big sticks. I also think with Intel's latest Haswell chips, the core components have probably come of age. Technologically, in other words, it's now doable. I'll come to the specifics in a moment, but I've been playing with a device that squeezes a full-on Intel Haswell Core chipset into something of truly tablety proportions. So the form factor is demonstrably not an issue. OK, Intel's pricing for this kind of technology may make for a fairly expensive end result. And question marks remain over battery life. But I can't see any reason why there shouldn't be a wide range of Windows-based tablet convertibles to choose from, all of which really deliver on the concept. And what a concept it is. To clarify, I absolutely adore laptops. It's easy to forget just how powerful and versatile they are. But I also reckon tablets are delightful in some circumstances, albeit less often than a lappie. If I had to choose just one, it would be the laptop. But a tablet convertible based on Windows and with a proper Intel processor promises the best of both worlds. I know, that's a tragic cliché and almost never true. But seriously, I cannot see any downsides to a convertible done right. If it's of proper tablet proportions, then you get a proper tablet experience. And if the keyboard plugs in to form a well balanced notebook-style portable, then you'll get the full laptop experience. It might actually be greater than the sum of its parts if the keyboard half of the equation, for instance, brings a few lithium cells to the party and actually increases overall battery life. Anyway, my quest is to both discover whether the overall concept really works and which come closest to the ideal. And I'm starting with the Sony Vaio Tap 11. Now, I shall very shortly unleash some pretty spectacular vitriol regards my overall views on the Tap 11. For me, it's a total failure as a device. And yet it's also a delightfully tantalising start to my quest for tablet-convertible perfection. You call that a kick stand? And anyway, if the first device was perfect, my quest would be over before it began. So what's so exceiting about the Tap 11? Proportions, that's what. Were you not to know exactly what it was, you'd pick it up and think nothing of it. Oh, it's a tablet. And that is a minor triumph for a tablet with an Intel Core processor. You don't have to make any excuses. It's not a case of it being decently slim given the powerful innards. At sub 10mm thick, there are some thinner Android devices and iPads around. But it's very much in the same ballpark. That's not something you can say about, for instance, Microsoft's Surface Pro 2, as nice a physical object as it is. So, whatever else I think about the Tap, it proves Intel has shrunk the power envelope of its Haswell chips to the point where you can have a proper PC inside a genuine tablet device. As for where the Tap fails, well, a large part of that is a function of being massively flawed, conceptually. It has a full-function keyboard complete with trackpad. But it doesn't clip in when in use. Instead, it's the free floating sort, which is fine when you have a flat, hard surface to hand, but useless just about any other time. Compounding the problem is perhaps the silliest kickstand I have ever seen. It's tiny and borderline useless bar the aforementioned flat, hard scenrio. At least Microsoft Surface's stand is a full-width flap that gives you half a chance of propping the thing up. The other issue is battery life and here it's hard to know excatly where the blame lies. Four to five hours is probably your lot, and that simply isn't good enough. Did Sony skimp on the battery? Are Intel's Core chips still a generation away from all-day battery life in a tablet enclosure? There are questions that can't be answered with a sample of one. I am, therefore, ever hopeful of finding my perfect tablet-convertible. Keep your scanners peeled to my posts on TechRadar for regular updates as I pick my way through the best the industry currently has to offer.